Trade Diversification Minister Jim Carr said today that any efforts to reform the global rules-based trading order must include the world's two largest economies, China and the United States. 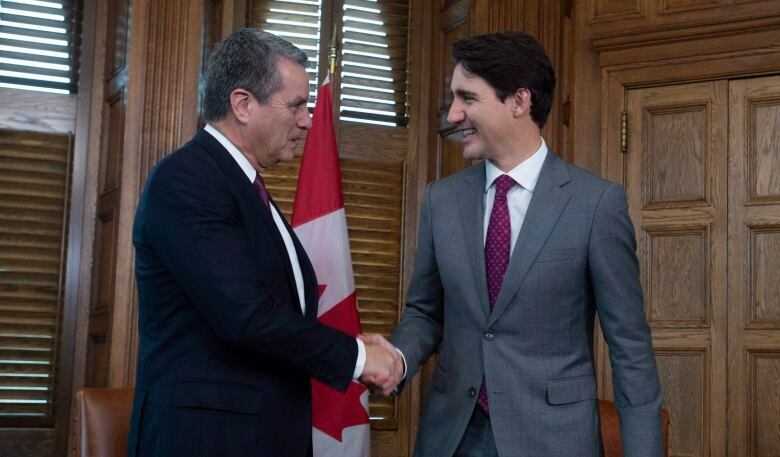 Carr made the comments after a day of meetings in Ottawa with representatives from 13 World Trade Organization members who came to Ottawa to start work on fixing the increasingly troubled global trading system. "We are setting the framework for a more constructive momentum around real measures for reform," Carr said at the closing press conference. "Starting small has allowed us to address problems head-on and quickly develop proposals. "That said, we recognize that we are in the process of setting the table for a larger effort, broadening to all members, and that effort must include the United States and China." Carr also said the work would have to expand eventually to include all 164 members who currently subscribe to WTO rules. 'Look like you're doing something': Canada hosts trade reform talks without the U.S.
Only 12 other WTO members joined Canada for this first gathering: Australia, Brazil, Chile, the European Union, Japan, Kenya, Mexico, New Zealand, Norway, Singapore, South Korea and Switzerland. The group was intentionally diverse, with representatives from different geographic regions and from states at different stages of economic development and integration. Nevertheless, they all "share the value and belief that the rules-based international order is worth preserving, and the best way to preserve it is to reform it," Carr said earlier in the day. 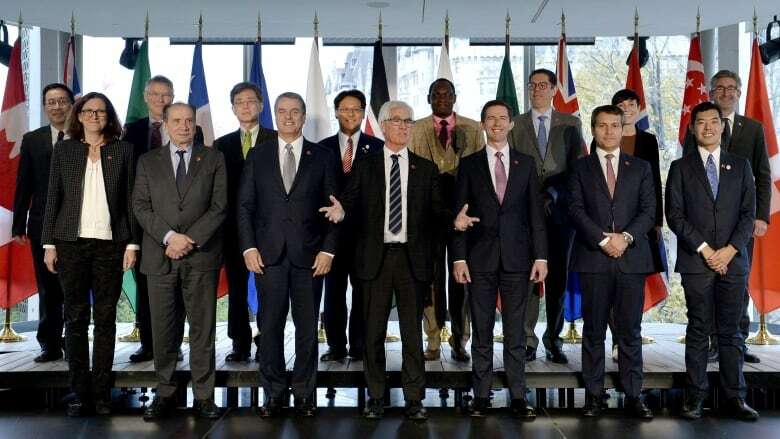 Roberto Azevêdo, director-general of the WTO, said that the idea behind the meeting was to start small and find common ground that could be sold to the wider membership. "I think what this group wanted to do was have a conversation among what you could describe a little bit as 'like minded people,'" he told CBC News Network's Power & Politics. "So, an open-minded conversation about where to go, what steps to take." After the meeting, a joint communiqué was issued outlining three areas that require "urgent consideration." Improving the efficiency and effectiveness of the WTO monitoring function by requiring more transparency from members in reporting their trade measures. Safeguarding and strengthening the dispute settlement system by trying to divert more issues from adjudication, clarifying the mandate of appeal judges — and resolving an emerging crisis as the U.S. continues to block the appointments of new appellate body members while the terms of the few who remain run out. Modernizing trade rules for the 21st century by figuring out ways to address emerging issues when the WTO's traditional form of consensus decision-making fails. Azevêdo said his number one priority was to resolve issues around the dispute settlement system. "If we don't have that element, it is going to hurt that system significantly and we are stuck at this point in time on this one." Carr hosted the group for a private dinner Wednesday and joked Thursday morning that some participants might have gone short on sleep. In the morning session, Carr said he was "very impressed with the candour and the sense of the importance of the discussion." Delegates shared their feelings on the status quo and the impetus for reform with a lot of passion, he said, while declining to describe any of the specific views shared in the closed session. While beefs about the WTO have been around almost since its formation in 1995, the global disruption caused by an escalating tariff war between the U.S. and China has focused minds on the inadequacy of current rules for present-day threats to fair trading. The U.S. worked hard to build the WTO, but it's no longer clear it wants to maintain it. When U.S. President Donald Trump threatened to pull out altogether, it became obvious the status quo could not stand. Carr was careful in his opening remarks not to pin too much blame on the Americans, whose blessing will be needed for any reform process to succeed. "The problems facing the multilateral trading system were not created by any one WTO member. They are not new and they cannot be solved by any one member," he said. Organizers of the Ottawa talks thought it could be more constructive to hash out early reform proposals through a fellowship of "like-minded" trading partners who weren't currently in active economic combat. Senior American officials are skeptical of the value of the multilateral rules-based trading system and are pursuing "America first" policies that allow the U.S. to use its economic clout as leverage in negotiations. The WTO, by contrast, was designed to address the concerns of smaller economies and less-developed countries. In particular, the U.S. objects to China's status in the WTO. It argues that it shouldn't be treated like a market economy, since the state effectively controls its industries. American officials want any WTO reform process to focus on clamping down on China's unfair trade practices — but it's not clear that was the main focus of the Ottawa talks. Business associations from Canada, Europe, Japan, Brazil, Australia, New Zealand and Mexico issued a joint statement Wednesday saying the WTO is "badly in need of an update to reflect the realities of a changing global economy," and urging members "to work together to enhance its functionality, transparency and fairness." "The WTO plays an essential role in helping to adjudicate and resolve trade disputes. Unfortunately, the dispute settlement system has become overburdened and must be fixed if the WTO is to live up to its potential," it said. Several initiatives are underway to change the WTO. The Americans have engaged the EU and Japan in one process that appears to be focused on rewriting rules that allow China to hold an unfair advantage. Anything hashed out by this group must complement the work others are doing, Carr said. "The fact that there are a number of parallel initiatives illustrates the importance trading nations place on the rules-based system," he said in his opening speech. "If you had a meeting of 163 of your closest friends could you agree on much? And how long would it take?" Carr told reporters. "It's not easy." This group plans to meet again in January 2019 to review their progress.